Each summer through high school I worked on farms around Corbin and played softball at night. I really disliked driving a tractor for fieldwork! It was dirty and noisy, but mostly it was lonely and boring. To amuse myself I sang, I yodeled, and I played mind games, like learning to recite the alphabet backwards. Workdays often started by 6:00 a.m. That is to say that I was on the tractor in the field by 6:00 a.m. Usually we finished by 7:00 p.m., except perhaps in wheat harvest when we would work until dark. For those long days and hard work I earned $8/day plus my meals and a place to sleep. Each morning when I blew my nose it came out mostly mud. Because of my light complexion, I sunburn easily and did on a few occasions. With Mom's insistence and good sense I wore a straw hat and long sleeved shirts. After grade school I mostly wore jeans and don't remember ever driving a tractor in bib overalls. Dad wore overalls constantly for work, and I don't believe he ever wore blue jeans in his life. The farmers I remember best having worked for were the Orville Ginns, the Clifford Lungrens, and the Joe Nuliks (Kenneth's parents). Bess Ginn, Ruth Lungren, and Jennie Nulik were great cooks and knew how to feed a growing boy whose highlights of the day were lunch and supper. I remember a few scary times doing farm work. Once while driving a tractor for Dale Rains in a very large field I turned to check my implement, and an airplane was headed straight for me at low altitude and very close. I ducked! The pilot was a friend of Dale's and thought it was him on the tractor. One time working for the Ginn's in a field just East of Corbin one of the front wheels of the International WD9 tractor fell off, and before I could stop I ran over it with a rear wheel with quite a jolt. Another time a bolt broke in the tractor seat, but luckily I had a good grip on the steering wheel, which kept me from falling off. There were funny times, too! Joe Nulik had 2 old tractors, a Model L Case and a John Deere D, both made in the 30's. Whenever we moved from field to field we drove in 'road gear’ that for those old tractors wasn't much faster than a brisk walk. I drove the John Deere, which was just slightly faster than the Case. I often ribbed Joe that I could drive faster than he. On one particular trip to a field Joe started gaining on me and came up very close behind and waved and laughed. Later I discovered that on a downhill section he put his tractor in neutral and it rolled down faster than it would run in 'road gear'! Another time Joe and I were working a field together I looked up to see him off his tractor and chasing it while it ran in circles around him. Somehow he had fallen off and it got away from him. He never did explain what had happened, but he sure did cuss that old tractor. There were foolish times as well. As a 4-H member I had taken tractor maintenance as a project, and safety was one topic we spent time with. As a driver I was pretty careful and knew the consequences of inattention. Once while working for Clifford Lungren I finished a field and was ready to leave in the pickup parked in the field for me. The pickup battery was dead and there were no jumper cables. I decided I could start the pickup by pulling it with the tractor. The process was tricky to say the least. I hooked the pickup to the tractor with a chain, put the pickup in neutral, and then started pulling it with the tractor across the field. Then I hopped off the tractor still in motion ran to the pickup, put it in gear and started the engine. Then with the pickup running in neutral and still being pulled by the tractor, I ran back to the tractor and slowed it to a stop with the pickup still running. With no accidents or death in the process, I was really proud! That same field was the site of my most painful accident. I was refueling the tractor by pouring 5-gallon cans of gasoline into a funnel to the tank on the top of the tractor. A pickup was parked next to the tractor and I had one foot on the pickup and the other on the hood of the tractor. The tank overflowed and caused me to slide off between the tractor and pickup. On the way down I grabbed the funnel that then poured gasoline over the side of my head and into my ear. Gasoline in the ear is the sharpest, most intense pain I've experienced. I drove myself to the hospital, but nothing could be done but let it evaporate, which it did in a few hours. As noted, my summer nights were spent playing softball. Mostly I played second base and sometimes played fielder. My Corbin heroes were Bob Rice (also second baseman) and Eldon Gracy. Kenneth Nulik played for a Caldwell team and he was my hero, too. Corbin had a 'first' team and a 'second' team. The 'first' team was the men and the 'second' team was rag-tag kids like me. Once, when I was playing second base, I made a spectacular shoestring catch of a line drive while running to my right. Since my glove was on my left hand it meant crossing my arm over so that my back was to the ball. Dad thought it was one of the best catches he'd ever seen, and I remember the experience as if it were yesterday. Brief moments of glory generate lasting memories. In another tournament game in Caldwell our 'second' team had unexpectedly reached the finals and we were playing for first and second in the tournament. We were batting in the last inning and trailing by one run. The bases were loaded with 2 outs when I came to bat. I hit the ball deep to left field, but alas that was where their fielder had moved. With a leap and a stumble he caught my fly ball for the final out. Brief moments of disappointment also build lasting memories. 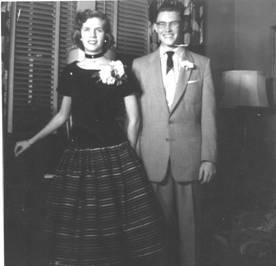 In August '53 Mom and I enrolled me for Caldwell High School. On that day I met for the first time, John Dillard, who has been a life-long friend. John and I discovered we had taken all of the same classes at all of the same times. Remarkable! Well, not really! There weren't that many choices at Caldwell High School, but we both thought it was remarkable at the time. For all four of our high school years John and I took the same classes at the same time, by intention. I thought that I would never forget the Caldwell High School song. Yet, when I tried to recall it for this writing, both words and tune were elusive. Joann gave me a copy of the words and they all flooded back in a rush. Songs generate memories. There were other verses as well, but they all go mumble, mumble, mumble, mumble. In August 1953, I decided to play football. Caldwell High School had quite a record of excellence in football, and for most all boys it was THE thing to do. I lasted less than a week. It was awful! I was a 120 lb. weakling and others were not. For my freshman year I rode to high school from Corbin with Norma and Patty Wilson and Barbara Schlottog. They had to wait after school for me to practice football, so I used that as an excuse not to play. The class I remember most that year was Algebra. I loved math and that year for the first time freshman were permitted to enroll in Algebra, even though there were also Sophomores, Juniors, and Seniors in the class. Our instructor was the Superintendent of Schools, Clarence Martin, a bald-headed navy man. He was excellent - good teacher, good with discipline, great sense of humor. I credit him with stimulating my lifetime interest in mathematics at a formative time in my education. John and I did very well in that class and in all others as well. There were no special girls in my life that year and I had no interest in finding one. That's not to say that I didn't have fun with the girls, but just that there was not one 'special' girl. High School was a wonderful experience, and I remember those years with great fondness. There were very few bad moments. As I recall my classes that year were Algebra, English, General Science, Physical Education, and Woodworking. I believe I got 4 A's and 1 C that year. Woodworking was a bad experience! Our instructor was Richard Johnson, no relation to our Richard Johnson. He was tough and I had no skills or experience with woodworking. Besides sanding blocks, which I never did make correctly, I made a set of ping-pong paddles for the Corbin Methodist Church basement and a magazine rack, which Mom and Dad politely kept for years. Once in class I got into a fight, something really rare for me, and we each got swats with a big paddle. Clifford Johnson and I stood face to face while Mr. Johnson gave us swats with paddles in each hand. I have no idea what the fight was about. In the spring of '54 I went out for track, a sport where you don't try to hurt anyone. Our track coach was George Hutchens, who has retired to Bella Vista, Arkansas and with whom I visited earlier this year. George was a good coach, friend, and mentor to me throughout high school. He was my ping-pong playing opponent at noon on days we weren't playing chess. I was a sprinter in track and considered the quarter mile a long distance race. That year and all following I was good enough in track to earn a school letter. One of my running buddies that year was Morris Johnson (Judy's brother), a distance runner. As a freshman from Corbin, I was a 'nobody' in the class hierarchy, but by the following year I was established as a class comedian and elected vice-president of the sophomore class. Probably the biggest event for me that year was getting my own car. Dad was a heavy smoker, but he really felt strongly that it was not a good thing, so he promised me a car if I never smoked before age 16. I don't remember how old I was when he made that promise, but I was pretty young. He reminded me regularly of that promise, and it worked. To this day I've never used tobacco in any way, shape, or form - not even a puff. The idea of having my own car was motivational! Calvin and Patsy Blue had a green two-tone 1946 Chevy 2-door sedan. One day Patsy ran it out of oil and ruined the engine. That was my big break. Dad bought the car for $100 and proceeded to rebuild the engine for another $100. It was ugly as anything, but it was mine and it ran very well. It served me faithfully through high school and beyond. When it had lived its life, Dad sold the engine and the two of us took the rest apart for the bolts and scrap. We then hauled the body to a trash dump southwest of the old Niebaum farm near the Chikaskia River. I used to have sad dreams about abandoning my car there, long after Judy and I were married. After we were dating Judy wrote JJ and JN in lipstick on my inside car mirror. That mirror, a few bolts, and fond memories are all that remain of my ugly old green car. Just a few years ago we stopped along the road near there, as I wanted to see if I could find my old car. The cow pasture path to the dump was gated and locked, so we gave up. Another purchase that year changed my life forever - eyeglasses! I found that I had to sit near the front of the classroom to see what was written on the board. Dad and Mom both wore glasses, so it seemed natural that I would need them too. Mom took me to our eye doctor in Wellington and I was fitted with bifocals. I still remember the thrill of stepping outside that Wellington office and seeing the leaves of trees as individual parts in 3-dimensions. My world had been very flat and blurred. John Dillard was a football player. As a close friend to John, it was difficult for me not to be involved in football. 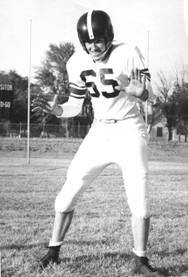 Caldwell had finished two undefeated seasons and so, at the beginning of my junior year, once again I tried to be a football player. My summer farm work in the hayfields had built me up to 145 pounds, and I was counting on my running speed to keep me out of harms way. George Hutchens had risen to head football coach by then and he, too, encouraged me to give it a try. Practices were hot, hard, tiring experiences. I remember sucking on lemons to quench my thirst. The inexperienced players made up the 'B' team. I was on the 'B' team. I played halfback on offense and defensive back on defense. The first time I ever carried the ball in a game I was left halfback. The play was a handoff to me straight ahead through the line. I made it to the line of scrimmage, was flattened, and had to be helped off the field. But in the 'B' team games I gained some yardage and made a couple of touchdowns. I really got hooked on football or the brief moments of glory, I'm not sure which. The only time I ever got hurt was in tackling practice. Alfred Lowe was an all-state fullback. In practice one day the two of us were one-on-one. Unfortunately, I was the one he was on. He cracked two of my ribs and I missed a few games. I remember the pain as second only to gasoline in the ear. Our junior year football team was undefeated as we stretched the string to 3 years. Winter of '55 was a busy fun time. I played a high school principal in the junior play, "A Dance with Our Miss Brooks" in early December. At one point in the play I was supposed to read some lines offstage. I missed my cue and the actors (Marilyn Lungren in particular) had to improvise. I was initially horrified, but with time it became a pretty funny incident. I wasn't dating much by our junior year and John was in between romances, so we talked about whom we should be dating. A great looking sophomore, Judy Johnson, had been flirting with me in the high school hall between classes. On one occasion she even squeezed my neck on the way downstairs. She recalls that I was wearing a white dress shirt and jeans for boy’s quartet, which she says first attracted her. After consultation with John, I decided to ask her to a movie. On February 4, 1956 we had our first date - a Friday night movie at the Ritz Theater in Caldwell. I don't remember the movie, but I do remember having a fun time. Did we kiss on that first date? Heavens no, we dated for almost a year before our first kiss. I believe it was on our second date that I had to help her father catch chickens and put them away for the night before we could continue on our date. As president of the junior class, I had responsibility for getting our class organized to plan the Junior-Senior banquet. By tradition the sophomores served the banquet, and the sophomore class selected Judy as one of the servers. She was my beautiful date for the evening. I took a flower corsage gift when I picked her up at her farm home. 2 You are my special angel And I'm in heaven again. This car-singing ritual continues to this day. It used to drive our kids crazy, which made it even more fun. By the spring of '56 I was a pretty good track star by Caldwell standards. I could run the quarter-mile in 55 to 56 seconds rather consistently and often ran in the mile relay (4 quarter-mile runners). It was always the very last event of a track meet, so I was tense throughout the entire meet. We were given box lunches for the track meets out of town, and they were always a cold beef sandwich, a Hershey bar, and an apple. My junior year was the first time I had real track shoes. They were baby blue and the first pastel shoes ever worn by a Caldwell High track team member. It was Mom who agreed to buy them and encouraged me to get them. She was a lot more skeptical about my football career than track. 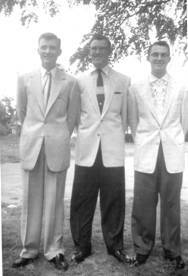 In the summer of '56, Roger Whitten, John Dillard, and I visited the University of Kansas as potential students. We all three decided it was too big and dismissed KU as "unlikely". It had nearly 8,000 students by then. I think that was the summer we decided to take an airplane ride over Wichita. We drove out to the Wichita airport and hired a pilot to take us up. As I recall, it cost us $6 each, but what an adventure! I don't recall thinking anything profound, like "I'm going to fly my own plane someday." Nevertheless, the fun experience helped set the stage for my later interest in being a private pilot. By summer of '56 I was ready to try any kind of work that didn't involve farming. 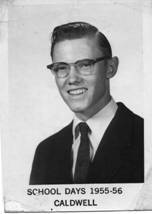 Kenneth Nulik was a driller for an oil company. That meant he had responsibility for a crew of men to drill for oil. He was working on a well at Haven, Kansas near Hutchinson and needed crewmembers. It was my big chance to escape the farm! The work was hard and interesting, soft and boring. The real work came when a new section of pipe was needed to drill deeper, or when the bit at the bottom of the pipe needed replacing. Then the work was frantic and scary! My job was to wrap ("throw") the chain around sections of pipe so that one pipe section would spin to thread it to the next section. The chain and pipe were spinning at face level and required gloved hands on the chain to keep it from spinning into your face. Once, my hands slipped and the chain nearly hit my partner. I remember the work being hot and loud, with large diesel engines running at all times. I was just learning to be a good "roughneck" when my career came to an abrupt halt. I got the mumps! On a Saturday night drive-in theater date with Judy, I took a big bite of hot dog and nearly screamed with a sharp pain in my jaw. My jaws were swollen and I told Judy I thought I had the mumps. She thought I was kidding for a while, but sure enough it was the mumps! Judy had never had them either, and waited several years until after Richard was born to get them. Early in the disease I didn't feel so bad and didn't stay in bed either - big mistake. The mumps moved from my jaw to my right testacle! Fortunately, it was only the right one or this epistle to my children and grandchildren might have been unnecessary. Poor little guy swelled to the size of an orange and turned purple. The pain was intense, and I had to sleep with a pillow between my legs. Trauma stimulates memory. The doctor recommended that I not do heavy work for the rest of the summer, so I took a job as an iceman in Caldwell. The pay was terrible ($5 per day or something close to it), but the work was pretty easy. I made deliveries of ice to homes and businesses early each morning, then spent the rest of the day at the ice plant selling ice to drive-by customers. I remember reading an Earle Stanley Gardner mystery and Arthur Conan Doyle's "The Lost World" that summer at work. My boss was Lester Rice, owner of the plant, and father to Bob Rice, one of my softball heroes. Lester was a gentle, easy soul and a great guy to work for. 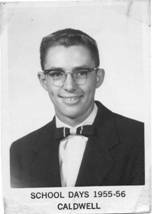 In the fall of 1956 I turned 17 and began my senior year of high school. Once again I played football, but this time had more success and occasionally became hero of the moment. The local newspaper reported it this way: "It isn't that the opposition can't catch Caldwell backs, it is only that it takes them so long. (picture of me) Here an unidentified Kiowan drags down Caldwell's Jerome Niebaum from behind after Niebaum had raced 44 yards with kickoff return in Caldwell's 38-0 blanking of league opponents Friday night." That season both John Dillard and I scored winning touchdowns for our team in separate games. I was so naive about the rules of the game that for years I thought my touchdown against Anthony might have been an incorrect call by the refs, because my knees had never crossed the goal line. Only years later did I learn that only the ball needs to cross the goal line! I did score! Two football plays stand out it my memory from that year. Once I took a handoff and ran about 70 yards for a touchdown, going as fast as my skinny little body would take me, because I understood the consequences of getting caught. The next day my Aunt Leona called her sister to report that I had made a "home run" in the game the night before. My family never did really understand football very well. The second play, which stands out, was a defensive play. I was so light that it was difficult for me to tackle anyone, especially by myself. I played defensive back, which meant that I was primarily there for pass defense. On one running play in front of our team bench there were only me and the guy with the ball running towards me. I heard Coach Hutchens say, "All right Niebaum, he's all yours!" Never have more frightening words been uttered to a struggling young football player, but they were inspiring as well! The runner hesitated slightly just as I hit him full-force. It was not a good tackle, it was a GREAT tackle! I hit him low at mid-section and kept my feet driving forward. The impact pushed him back a couple of yards flat on his back. It was hard to say who was the most surprised, the coach, or me but it certainly was a shared surprise! In all of my football experience it was a singular success. Now, nearly forty years later, I remember that experience as if it were - important. Only a tie with Derby marred our senior year football season. By our senior year John D. and I had taken all the math courses offered at Caldwell High School, but we wanted more. Our math teacher and principal, David Shannon, agreed to help us learn Trigonometry on our own. For one whole semester John and I were self-taught in a small room just outside the library. Mr. Shannon periodically gave us standardized tests to check our progress. We never did particularly well on those tests, but we made enough progress to enter college at the Calculus level. At the 1995 Caldwell High School homecoming reunion David Shannon returned from retirement in Kentucky to renew Caldwell acquaintances. Not only did he remember our self-taught trig class, he also reminded me that for the other semester John and I sat at the back of one of his advanced math classes and continued to learn algebra. Judy and I dated regularly my senior year. I was falling in love; she was falling in like. At the end of my junior year she wrote in my yearbook, "Lots of luck to a swell guy!" In my senior year I was a little bit more than a 'swell guy'. I tried to convince her we should go 'steady' (i.e. date only each other). That also implied wearing my class ring around her neck as a symbol of 'going steady'. She said 'no' repeatedly. After I had a date with one of her classmates, she decided it was time to go steady. Her parents were somewhat less excited about it than we were. We really enjoyed being together and talking and laughing. We shared a love of movies, though Judy had been movie-deprived as a child. We tried to make up for the movies she had missed. Our drive-in theater, the Bi-State, was new and located just across the border in Oklahoma, south of Caldwell. When it closed for the winter, the Ritz Theater in town opened. I no longer sat in the front row with LaRue. That year I gave Judy a pink clock radio for her birthday surprise, but LaRue told her what it was before she ever got it. Strangely, that didn't bother her or me at all. Judy likes to know about her surprise ahead of time. In fact she will seek out hidden packages anywhere in the house and peek, just in case. In high school I never was a discipline problem for teachers, but I was a bit of a wise guy at times. Once it landed me in trouble with Superintendent, Clarence Martin. Our boy’s glee club (vocal chorus) had an evening performance and Mr. Martin was trying to keep order while our choir director, Maxine (Melka) Krenek, was busy with the girl’s chorus elsewhere. Mr. Martin was getting frustrated with all the noise and hubbub. At one point he said to all of us, "Sit down and shut up." To which I replied, "Yeah, he means it, too!" It drew a good laugh, but not from Mr. Martin. I had to sit in the audience for the evening performance. Everyone was shocked! Tough lessons generate memories. From the time I had been in seventh grade it was clear to me that I wanted to be a math teacher. To reach that goal required a college education. Judy's brother, Morris, was a freshman at the University of Kansas (KU) my senior year, and living in Jolliffe scholarship hall. My family and I knew it would be very tough for us financially for me to attend college. The scholarship hall program at KU sounded very interesting to me. Men in the hall were responsible for cleaning, cooking, and all other household chores in exchange for a low monthly housing cost, so I applied and asked specifically for Jollife. 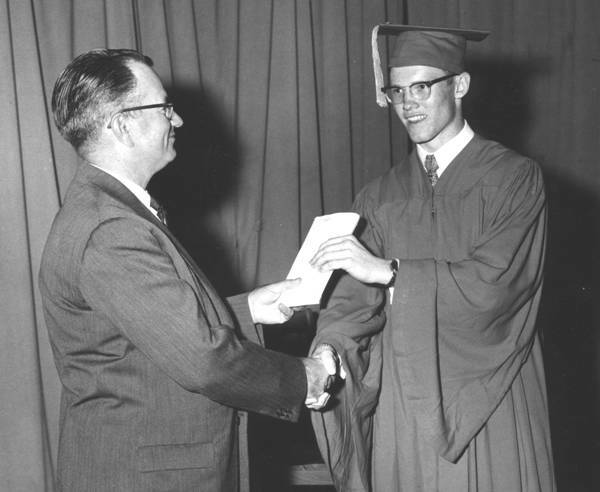 Gratefully, I was selected and it solidified my decision to attend KU in the fall of 1957. For high school graduation my parents gave me a 'word processor'! It was a Royal portable typewriter that they ordered from the Corbin Hardware, which Finace and Ralph Watts owned and operated. I remember helping pick out the brand and style from a wholesale catalog they used, called the Blue Book. With shipping and tax it was about $100, which was quite a sum at that time. With that typewriter I developed important keyboard skills which have served me well for nearly 40 years and which I use daily. The typewriter also gave me an edge in college that students with their own personal computers are now experiencing. Though Judy and I continued to date regularly, by the end of my senior year we had decided to stop going 'steady', since I would be off to college in the fall. As I recall it was a mutual decision that I wasn't in favor of. By then her parents were treating me pretty much as a real person. I think they even liked me! High school was a safe haven and a comfortable place for me. I did well scholastically with little real effort. I had many friends and a lot of fun activities. Graduation was both exhilarating and a little frightening. I was confident in myself and over-confident in my abilities, a malady that still persists. It did surprise me a bit when I was named salutatorian (number 2) in my class. Sibyl Ingle beat me out! 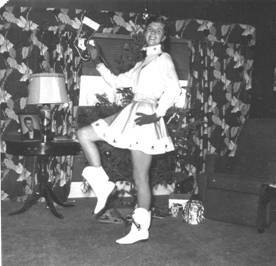 The tradition continued the following year when Judy was salutatorian of her class. Our son, Richard, continued that tradition in 1981 when he was salutatorian of his class. Daughter, Jerri Jeane, broke the tradition by being valedictorian (number 1) in her class at Lawrence High School in 1984. There are still many high school stories to tell, and I shall add them as new events call them to memory. As I finish this writing of recollections of my early history, Judy is on her way to Vancouver, Washington to visit our new grandson, Calvin Jay Clark, born November 28, 1995. But then, that's another story!